A South Korean space institute said Wednesday that one of its astrophysicists has suggested a way to protect a nano-sized spacecraft during an interstellar voyage project that was unveiled last year. In April 2016, tech investor Yuri Milner announced the so-called "Breakthrough Starshot" initiative to send nanocrafts to a small rocky "Earth-like" planet that might exist in the nearest star system to the sun, Alpha Centauri. The billionaire said he will inject $100 million to fund scientists and engineers to test the feasibility of sending a spacecraft on the 20-year journey. 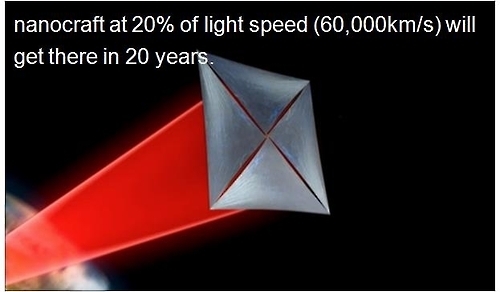 The craft will be designed to travel at 20 percent the speed of light. However, the project -- backed by Stephen Hawkings and Facebook Inc. co-founder Mark Zuckerberg -- faces many challenge including gas atoms and dust grains that the spacecraft could encounter on its interstellar journey. Thiem Hoang, a Vietnamese theoretical astrophysicist from the Korea Astronomy and Space Science Institute, has detailed a way to shield the spacecraft from gas and dust during the journey. "In this paper, we quantify the interaction of a relativistic spacecraft with gas and dust in the interstellar medium," the scientist said. The theoretical astrophysicist suggested putting on a "bumper" and 1mm-thick graphene foil, as well as a double shield that can protect the craft as it travels through space. "We suggested a practical strategy to protect the nanocraft," Thiem said, adding that the question "Are we alone" could be answered through the project.